Lately, and I don't know why for, I've found myself becoming more and more attracted to listening to harpsichord / keyboard concertos - just, not organ. I don't know why the organ pulls me the wrong way, just it does. Only I don't know where this sudden infatuation comes from. For the past year typically I've been listening to folk, indie and industrial. I just got, mm, bit by something and now all I want is Bach. Although I lie; I heard O Ecclesia by Hildegard von Bingen sung by a choir. There is nothing like Latin love poems chanted in vaulted ceilings to make your hair stand on end. 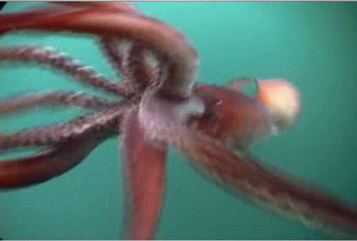 O', and here's an angry Humboldt Squid. Sometimes I think I should join a choir, and chant about cephalopods in Latin. The girl started to have visions of luminous objects at the age of tree, but soon realized she was unique in this ability and hid this gift for many years. obviously written by one of your milkmaid ancestors. just saw the photo. it didn't come up yesterday on my maChine. i seem to remember someone begging for a pet lobster for, oh, say two (2) whole years.